This entry was posted on Monday, December 3rd, 2012 at 7:23 pm	and is filed under Oakland, Politics. You can follow any responses to this entry through the RSS 2.0 feed. You can skip to the end and leave a response. Pinging is currently not allowed. 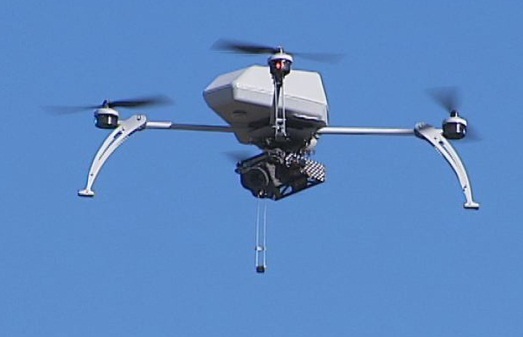 Do you know what one of these drones looks like flying overhead? Are they noisy enough to notice? “Wingspan” is about four feet, and the whole thing weighs less than 5 pounts. The motors and blades make a whispery buzzing sound, so you would definitely notice if it was 15 feet over your head, but if it was a lot farther away presumably you’d have to look up and actually catch sight of it to realize it’s there. The Sheriff’s Office claimed the drone procurement line in the request was just an accident or oversight, and that they hadn’t intended to request permission to buy it on Tuesday. Pretty tough to believe, since it’s been controversial for over a month. The possible plan will probably be discussed at a subcommittee meeting in January instead, but details still aren’t clear. I saw a dude playign with one on his day off in a Berkeley city park. Noisy thing, short fly time. This ACo toy would be similar. Woop dee doo. Anyway, vintage is IN. This would be soooo 1980s… SKYNET! !